Thu., Nov. 30, 2017, 2:40 p.m.
CORVALLIS, Ore. – Jonathan Smith introduced himself as head coach of the Oregon State Beavers with a simple message. “It is great to be home,” Smith said to applause from boosters gathered at a news conference on campus Thursday, a day after he was named to the job. Smith, a former Oregon State quarterback who led the team to a Fiesta Bowl victory following the 2000 season, comes to the Beavers from Washington, where he was quarterbacks coach under coach Chris Petersen. “Now I’m sitting here in front of you with my dream job, in my dream town, at my dream school,” Smith said . Oregon State President Ed Ray called Smith the “perfect person in the perfect moment.” A rally was scheduled for fans Thursday evening at Reser Stadium. Smith fills the vacancy left by Gary Andersen, who surprisingly parted ways with the Beavers in early October after a 1-5 start. The Beavers promoted cornerbacks coach Cory Hall as interim head coach. Hall appeared to inspire the team, which challenged Stanford in a close 15-14 loss. A group of players started an online petition supporting Hall, as well as a Twitter hashtag (hash)HALLin. But Oregon State still wasn’t able to muster a win. The Beavers wrapped up the season with a 69-10 loss to Oregon in the Civil War rivalry game to finish 1-11 overall and 0-9 in conference. Smith admitted that he wondered if a return to Corvallis might be in the offing following Andersen’s resignation. Smith joined Petersen’s staff as quarterbacks coach in 2012 at Boise State then moved with him to Washington in 2014. 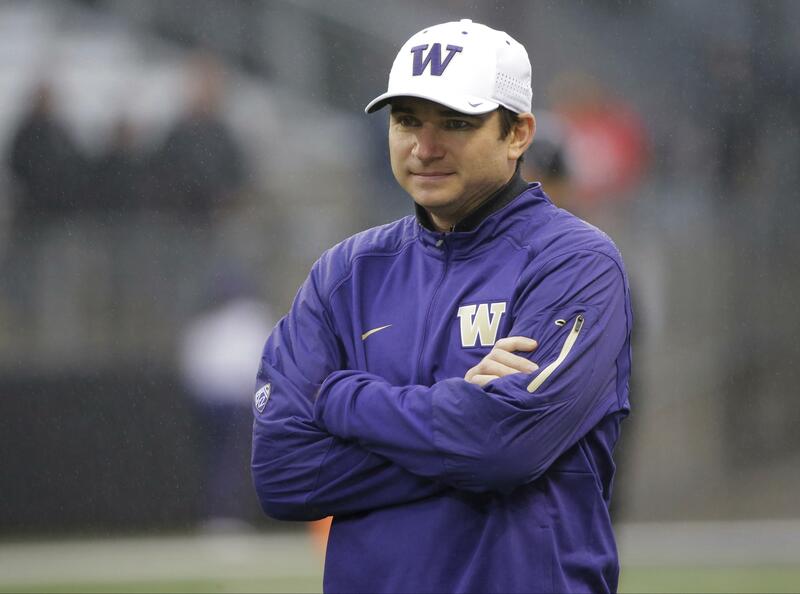 He helped recruit quarterback Jake Browning to the Huskies. Smith also had stops as an assistant at Montana and Idaho. He was a graduate assistant at Oregon State from 2002-03. A native of Pasadena, California, Smith was a walk-on in Corvallis, playing for the Beavers from 1998-2001. He was on Oregon State’s 2000 team that went 11-1 and defeated Notre Dame in the Fiesta Bowl under coach Dennis Erickson. A fan favorite during his playing days, Smith ranks third on Oregon State’s career list with 55 touchdown passes and 9,680 passing yards. He holds the record for the longest touchdown pass in school history with a 97-yard TD pass to Chad Johnson in 2000. Johnson was one of those who congratulated Smith via Twitter: “Congratulations boss, you deserve it, love you man,” he said. Oregon State athletic director Scott Barnes said Smith was among the first candidates interviewed following Andersen’s departure. He spoke in depth to Smith on Tuesday night and ultimately offered him the job. Hall’s future with the Beavers is uncertain. Smith said he had not yet met with him. Published: Nov. 30, 2017, 2:40 p.m.